1. Through the left administrative menu by clicking "Blog -> All blog posts". 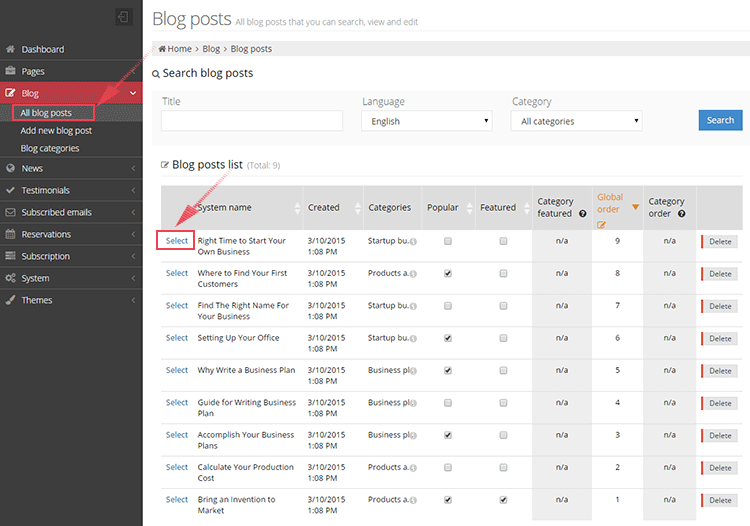 After this a list of all blog posts will be opened for you in a new window. Click on the "Select" link for the post you want to edit and a new page will be opened where you can do the editing. 2. Through the element that displays all the blog posts. To get to it, open the page with the blog posts and move the mouse over the post you want to edit. Click the "Edit blog post" link placed in the upper right corner. 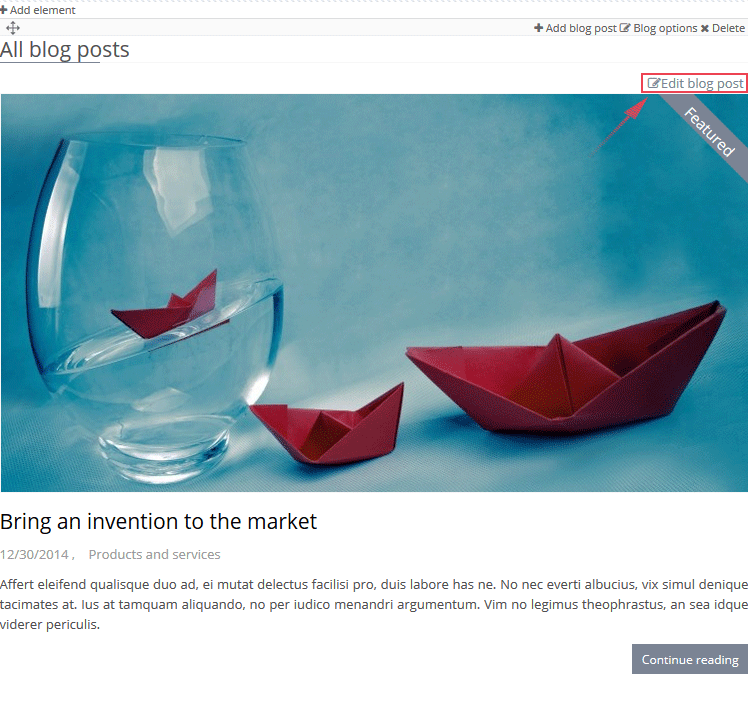 After the click, a new window will be opened where you can start to make changes in the text, images and the other blog elements. 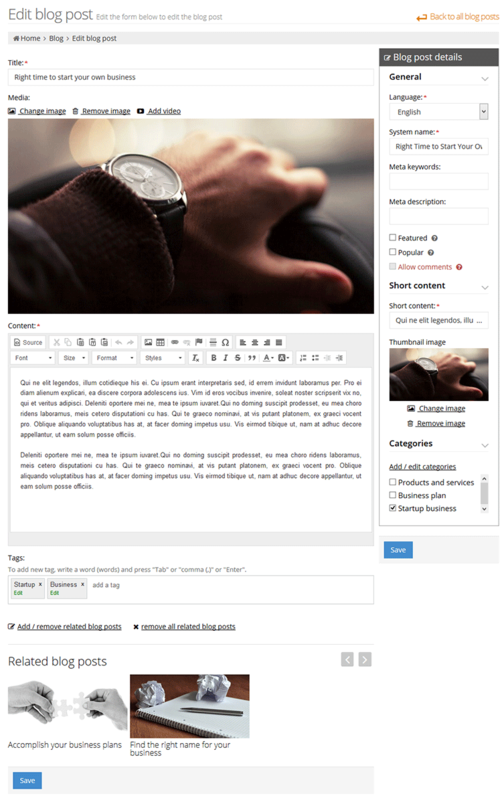 - In the "Content" field enter your text and edit it with the available tools. - In the "Tags" field enter keywords for the article. They will be visible to your website visitors to help them search for articles with similar content, i.e. when they click on a keyword (tag) the system will display a list of posts with the same keyword (tag). They are also important for your website SEO (the search engine optimization). - Click on the"Add/remove related blog posts" link if you have already written a post with a similar topic to the post that you are adding. A new window will be opened where you need to mark the related posts. Click on the "Close" button and the selected posts will be automatically added as related to the post that you are currently writing. - If you want the post to appear on the top of your blog, then mark the check box "Featured” in the right administrative panel. - If you want the post to appear in the category "Popular posts", then mark the check box "Popular" in the right administrative panel. - The short content for the blog post is a must and you should write it in the "Short content" field that can be found in the right administrative panel. - Fill in the remaining fields in the right administrative panel such as: system name, meta description, meta keywords, the category in which you want the post to belong in and then click the "Save" button to save the post.